Reference number for this case: 3-Oct-54-Moncley. Thank you for including this reference number in any correspondence with me regarding this case. BESANCON (from our newsroom). -- About twenty people affirm to have seen, at the beginning of the afternoon of Sunday, a machine of a luminous white and round form in the sky of Moncley, about fifteen kilometers from Besancon, in the valley of the Ognon. Among these people is a well-known grocer of the Carnot avenue, in Besançon, Mr. Durand, who was in weekend in Moncley. "In family, we completed our meal, Mr. Durand told us, when a tradesman of Moncley, Mr. Bouchaton, came to say to me that a white ball moved in the sky. I went outside and I noted indeed the presence of one of these objects about which one speaks so much currently and into which, like so many others, I did not believe up to now. "From now on, I actaully must change my opinion. I saw with my own eyes. I even had the time to go to seek binoculars which were in the house. When I returned, the object was still there. I managed to look at it through the binoculars. It was of a very bright white metal. It disappeared quickly at the horizon, towards the East. In its wake, it left small filaments of a more matt white. From the distance, they resembled these decoration which one calls, in the trade, gossamer threads [Blessed Virgin threads in French]." About twenty people, members of the family of Mr. Durand or people of the country, were witnesses of the phenomenon. They also saw the small threads. The events were to take almost at once a more precise turn, besides. These threads indeed arrived in a certain quantity on the ground. One found some which hung on a telegraphic wire. In Emagny, a few kilometres from there, and Vallières, in the suburbs of Besançon, the same substance was observed. In Moncley, some of it was collected by Mr. Dubois, a well-known carpenter in Besançon, now domiciled on the edges of the Ognon. We managed to see ourselves these small threads that Mr. Dubois gave to a tobacconist of Besancon, Mr. Magnien, who will have them analyzed by one of his friends, a chemist. It is a material quite similar to cotton or pulp paper, very dry, and apparently deprived of a particular property. 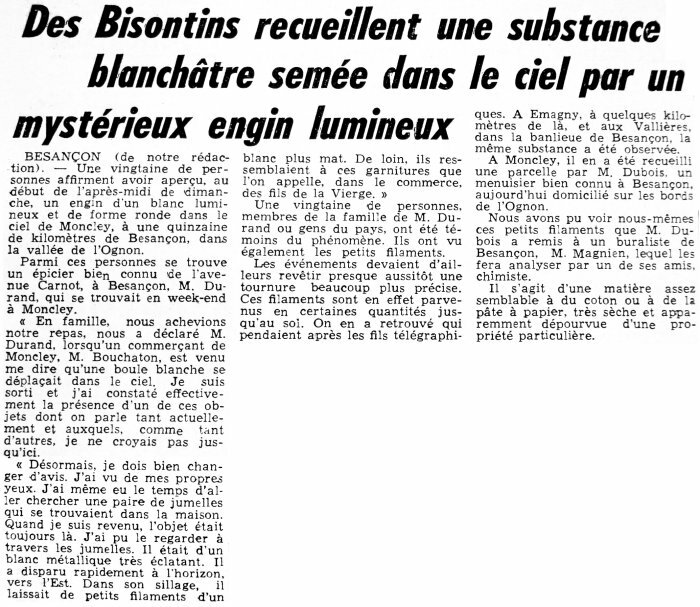 [le1] Article in the regional newspaper L'Est Républicain, France, October 5, 1954. 1.0 Patrick Gross June 5, 2010 First published.